In this period of state-sponsored austerity and suppression of resistance there is a great need for criminologists to speak out and act against state violence, state-corporate crime, and the growth of surveillance regimes and the prison-industrial complex. Criminologists also have a role to play in advancing alternatives to current regimes of regulation and punishment. 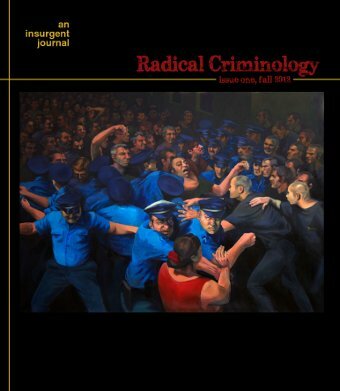 In light of current social struggles against neo-liberal capitalism, and as an effort to contribute positively to those struggles, the Critical Criminology Working Group at Kwantlen Polytechnic University in Vancouver has initiated the journal Radical Criminology. We hope you will enjoy our first issue and find it to be a useful resource. The present period represents an era of state capitalist offensives against the working classes and oppressed globally. It is played out in specific local maneuvers but is global in character. The main thrusts are austerity policies mean to break the infrastructures and resources on which the working classes and oppressed rely and to weaken possibilities for resistance and make people desperate and despairing. Conditions of austerity are effected through social and economic policies that limit the rights of workers on the labor market and at work and which remove alternatives to waged labor (such as welfare or low cost education). Along with austerity is the creation of crises and manufactured fear in the political fantasies of contagion (by terrorism, radicalism, or the foreign outsider). This fear is used to legitimize the deployment of repressive policies and practices (aggressive laws and policing patterns). This is also an era in which the previous models of social change and resistance—notably Marxism/Leninism and the vanguard party, national liberation, and social democracy—have been discredited and/or discarded. New generations of people, with no particular prejudices, biases, or commitments toward the radical political models of the past and their associated claims on rightness (and righteousness) have become politicized on new terms and from new beginnings. This poses both great possibilities and great perils. On the one hand, there is the danger of starting over from scratch—of needlessly making the same mistakes that experience might avoid, of reinventing the wheel (as a flat tire), of pursuing false leads and getting caught in dead ends (reformism and adventurism, statism and electoralism, guerrilla moralism and vanguardism). 1. Radical criminology must be anti-statist and anti-capitalist. It must not succumb to the myth, as libertarians do, that there is an opposition between capitalism and the state. The emergence, development, and continuance of capitalism have been entirely facilitated by state practices. Indeed, capitalism is unimaginable without the state. The expropriation of land, enclosure of commons, defense of privatized property, and repression of peasant and working class opposition—the very foundations of capitalism—are all acts of the state. Without the repressive apparatuses of the state, capitalism would quickly collapse. The idea that the state and capitalist market are oppositional forces is falsity that serves only to distort history and confuse matters. 2. A radical criminology must again recognize exploitation—the social exploitation of labor—as the central organizing feature of capitalist societies. The underlying motive force of the economy, exploitation provides the raison d’être of liberal democratic governance—that is ensuring and extending the conditions of exploitation of labor by capital. This too provides the impetus of criminal justice system policies and procedures since the earliest days of liberal democratic government. This has always been the foundation of criminal justice systems in liberal democracies. This is at the heart of these systems. Such practices have been central components of criminal justice practices from the start. Examples include the various poor laws and anti-vagrancy acts as well as state work camps and prison workhouses. 3. Criminal justice systems are themselves profit maximizing machines. The manner of their profit-making is the processing and punishment of the poor. Without the criminalization of the poor—as poor—criminal justice systems in Western liberal democracies would collapse or wither on the vine. In Canada, around 10% of the population live under the poverty line (even more are actually poor). Yet, the poor make up nearly 100% of incarcerated people. The single act of issuing one anti-panhandling ticket to a homeless person sets in motion a money-making assembly line of punishment and profit. Along the way various sectors of the system receive (unequal) payment which represents a transfer of wealth upwards (as the taxes of the working classes are transferred to the state agencies). First, there are the police officers who issue the tickets. Then there are the lawyers, bailiffs, judges, and jail or prison guards (to say nothing of the lower status court workers such as clerks and stenographers). At the end are the subsequent demands for more police and prisons to deal with “the problem.” Prison construction companies, corporate food services, prison industries (slave labor firms) all follow along. Without this profitable foundation in the punishment of the poor the system of state capitalist criminal justice could not persist. Police, court, and prison budgets would lose their prop. At the same time we should not assume as liberals often do that diverted funds would be put toward socially necessary ends such as schools or hospitals. Capitalist economies and liberal democratic governments are founded on expansionist practices (and policies) of enclosure. The history of colonial states is a history of displacement, land theft, murder, and genocide—all legally sanctioned and normalized. The impetus is the opening up of new areas of profitability and economic opportunities for capital. This is the real and integral character of state capitalist liberal democracies. These are not anomalies or digressions or mistakes or unfortunate features of less enlightened times. These are the pillars of capitalist economies and liberal democratic justice systems. Without such practices—the forced acquisition of cheap land and labor and the breaking of communal bonds—capitalism could not have developed. State capitalism requires, from the start, the dislocation of local communities and their sustenance systems and governance practices. 7. Radical criminology must be deep green. It must draw attention to and oppose the integral relationships between capitalist exploitation, business practices, and the destruction of the planet’s various ecosystems. It must also highlight the complicity of states and capital in this destruction and call out the refusal of states to hold economic elites accountable for the harms they perpetrate against human communities and nature. Too often criminology has focused on the low level crimes of non-elites. Harms have been constructed as violations of laws or impacts on individuals or their property. Radical criminology must shift focus to the harmful activities of corporations and businesses (and the people who direct them) which are often not criminalized or “against the law.” Radical criminologists must confront the hegemonic construction of the harm done by capital as simply part of business as usual. This includes confronting economic and political elites on the damage done to ecosystems, non-human nature, and other species—impacts that states and capital excuse as being mere externalities, part of the cost of doing business. B. We should also recognize that campuses are also sites of exploitation and struggle. Radical criminologists should oppose the corporatization of our various intellectual labours, including teaching as well as research. Among our efforts radical criminologists need to fight neoliberal policies that turn universities and colleges into prep schools for corporate expansion and financial markets. Even commentators long influenced by Marxism joined the chorus calling for the arrests of anarchists and others engaged in (or threatening to engage in) direct action. Judy Rebick, Sam Gindin Chair in Social Justice at Ryerson University and rabble.ca founder, suggested police should have preemptively arrested militant activists and angry residents involved in property destruction. Unfortunately, her plea was unnecessary as police had already done by arresting several prominent anarchist activists in the days prior to the G20 meetings in Toronto. Those committed organizers had their lives placed in turmoil for over a year and some received lengthy jail terms for having done nothing more than discuss the possibility of direct actions (in contexts in which police infiltrators were present). Thus the wish for preemptive arrests—which has no place among critical theorists or activists—had already been carried out. In times of crisis and intense social struggles—certainly in times of insurrection or uprising—radical criminologists must keep their heads and not succumb to moral backlash or fear, even of the Left and political progressives. It can be too easy for otherwise critical voices to lose confidence under the spotlight of state reaction and media outrage. In such times especially one must advance and sharpen—not lose or abandon—their politics. Radical criminology is not simply a project of critique, but is geared toward a praxis of struggle, insurgence, and practical resistance. It is a criminology of direct action. We are preyed upon by the lumpenproletariat - the gang members, thieves, rapists and drug dealers - and the working class on our own is not strong enough or organized enough to deal with them. So we have no choice but to look to the bourgeois state and it's police and penal systems to protect us. Irony - that same bourgeois state and it's cops and jailers do an even more thorough job of protecting the persons, homes and offices of the propertied classes - including the college educated professionals, the class to which the authors of this pamphlet belong to. While you praise the criminal classes and lament their prosecution by the evil capitalists and their state - that very same state and it's police officers protect you from being raped and robbed, and your homes and offices from being burglarized. Gregory A. Butler, what type of socialist are you that you would defend the violence of the state penal system against people seeking create a more liberatory system of life? Calling it privileged to wish for the abolition of prison is ridiculous. You are by no means a a socialist, radical, or libertarian communist. Is it privileged for you to wish that people who did nothing wrong, such as escorts or drug users? What about those who have been imprisoned in Russia for "spreading homosexual propaganda" or those in the United States who have been imprisoned for protesting or speaking against the government during the first and second Red Scares. How could you seriously advocate such a Hobbesian pro-state argument on Libcom?